Start by chopping the onions and then start them frying in the bottom of a big pot with a little vegetable oil while you peel/wash and chop the potatoes and leeks. When chopping the potatoes be sure to cut them into fairly small cubes (about 1cm each side) or they’ll be really hard to liquidize later. 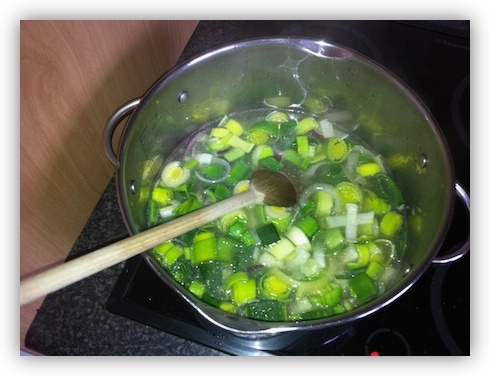 Similarly, when you’re slicing the leeks, don’t let any of the slices get any wider than about 1cm. 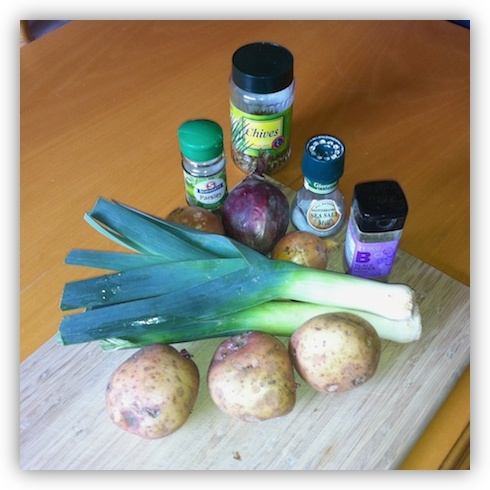 When the onions are soft, add the water, the diced potatoes, and the chopped leeks. Bring the whole lot to the boil, stirring occasionally, and then let it all simmer for 20 minutes, again, stirring occasionally. 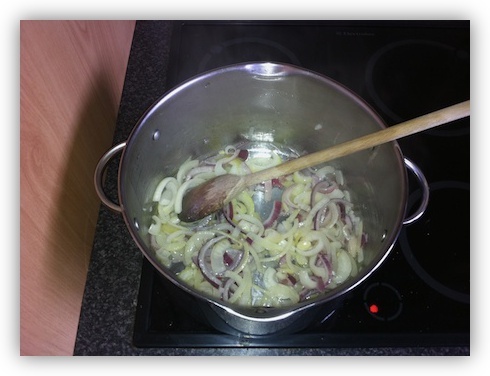 The oil you used to fry the onions in should help prevent anything trying to stick to the bottom of the pot. 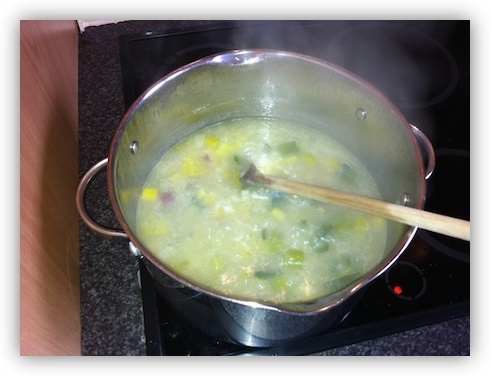 As it boils the potato should start to break up, and the water should stop being clear and go a greenish white colour. You should also start to get a lovely smell of leeks. When it’s been simmering for 20 minutes you need to take it off the heat and liquidize it. 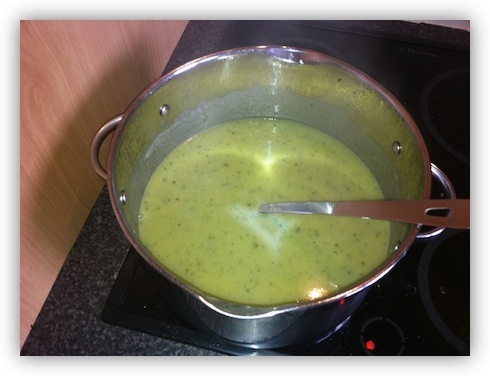 Next, put it back on the hob on a low heat and let it slowly simmer away while you season to taste with the fresh or dried parsley and chives, and the salt and black pepper – remember, this is two litters of soup, so you’re going to need a lot of seasoning! Finally, if you used dried herbs, let it simmer for another 5 minutes to be sure to soften those. That’s all there is to it! 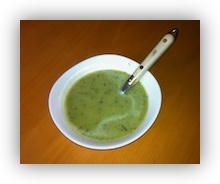 One thing I will say is that it’s worth the extra expense of using fresh herbs in this soup, especially fresh parsley. 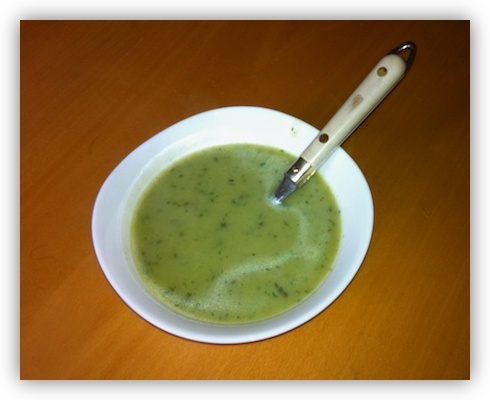 This may be the green soup – I’ll try it! !